Designating the best neighborhoods in Tacoma depends on what you are looking for as a resident of this mid-sized city. Some areas are definitely safer and more aesthetically pleasing than others. The factors we used included safety, cost of living, attractiveness, and nearby things to do. Tacoma’s crime rates are a bit higher than the average for Washington towns and cities overall, but this does not mean you will be victimized or even feel unsafe when you’re out and about. Despite a near constant slew of insults from Seattleites, Tacoma is a beautiful city with many safe areas. Statistically, the safest areas to live are largely in the north and west parts of town. North Tacoma neighborhoods such as Old Town, the Stadium District, and North Tacoma can feel like a completely different city than many areas in South Tacoma or the East Side. University Place, Fircrest, and Northeast Tacoma (Brown’s Point area) are notably safer than most of Tacoma as well. If you seek a short commute to downtown Tacoma, living closer to this area is best. The closest neighborhoods are North Tacoma, Stadium District, downtown itself, and East Tacoma. North Tacoma and downtown offer decently quick access to I-5 via 705, but, for the best I-5 access to Seattle, choose East Tacoma, with its freeway exit to Seattle on Portland Avenue. Be aware, though, that East Tacoma is still pulling itself up by its bootstraps. Parts of it feel safe and cozy, and other parts are still rough. On the other hand, you'll also get more bang for your buck with incredibly affordable real estate on this side of town. If you need quick I-5 access and want to live in Tacoma without really being a part of Tacoma at all, Northeast Tacoma is perfect; it takes nearly a half hour from there to get to Tacoma proper. As you might guess, the best Tacoma neighborhoods don’t usually go hand in hand with the cheapest real estate values. North Tacoma, Old Town, and University Place all have more expensive home values in general than East, Central, and South Tacoma. The only real challenge to this pattern is that downtown Tacoma is one of the least safe places statistically (though perfectly fine for daytime sightseeing), but its condos are quite pricey. East, Central, and South Tacoma offer a good balance of affordability. Outside of the Tacoma city limits, areas like Puyallup, the next town over from Tacoma, offer considerable deals on housing. Puyallup has several great neighborhoods close to the Sounder station as well as good freeway access via 167. Tacoma is surrounded by other communities worth checking out, especially if you seek affordable housing. Parkland and Spanaway are farther out from town and can feel a bit rough around the edges in places, but you will find great housing deals in these parts of town. If you want to be close to Puyallup, Lakewood, JBLM, or Pacific Lutheran University, these areas are also fine bets. If you work in downtown Tacoma or need quick access to I-5, they aren’t as ideal. Lakewood and Puyallup are two nearby towns at opposite ends of the small 512 freeway. Lakewood is ethnically diverse and puts you in close proximity to Tacoma’s Koreatown on South Tacoma Way (grocery stores Pal-do and Boo Han are excellent, if you enjoy Asian food) as well as JBLM, but neighborhoods can range from very ritzy to very rundown. Puyallup is the proverbial suburbia that boomed during the housing peak in the mid-2000s. As a result, there are many great neighborhoods and many larger homes (that you just might not find in North Tacoma or other older Tacoma neighborhoods). There are also many neighborhoods built in the 1980s and '90s that are great all-around bets. If what you want are things to do nearby, then there are a few clear choices. 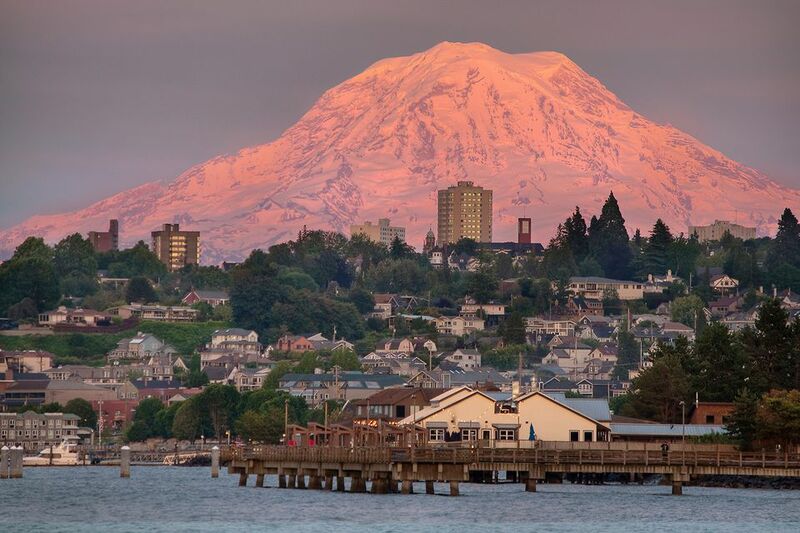 All of North Tacoma puts you close to the lovely waterfront and picturesque strolls. North Tacoma is also close to downtown, Old Town, and 6th Avenue, where you'll find tons of restaurants, bars, and shops. The Old Town neighborhood is small but has cute coffeeshops and restaurants to duck into as well as close proximity to the waterfront. Both North Tacoma and old Town lack major attractions, but they do have lots of little restaurants and shops tucked into enclaves and feature ample bike lanes and sidewalks. By far the best neighborhood for attractions is downtown Tacoma. This area has the Tacoma Art Museum, Museum of Glass, Bridge of Glass, theaters, and many of the best restaurants in town, all within a relatively small area. Unlike the rest of Tacoma, downtown doesn’t have cozy neighborhoods, but there are a number of condos (often luxury condos and often limited to studios, one-bedrooms, and the occasional two-bedroom) here if you want to live close to all the action. The Stadium District is very close to downtown and has some older housing and more condo buildings, including some of the most expensive condos in town. What Makes University Place Worth Living In?